Software download Activation key and and Mackeeper download will be sent to the address you provide in paypal or your credit card purchase. Mackeeper Software 3 License Lte Version MacKeeper 3 PACK! 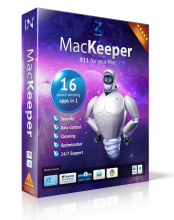 Total MAC Protection & Maintenance Software Download Mackeeper 3 LICENSES Save 30% - Retail is $89.00 MacKeeper Total MAC Protection & Maintenance SOFTWARE DOWNLOAD Once Purchased an Your own personal Mackeeper activation code and license will be emailed. This is a Software download No CD-ROM Product will be shipped! THIS PRODUCT IS A SOFTWARE DOWNLOAD AFTER PURCHASE. Software & Activation LICENSE key for 3 Computers will be emailed after purchase No CD-ROM PRODUCT will be shipped and of course no returns on software downloads. Milagro Mac has been servicing Apple Computers since 1990 and as an Authorized Mackeeper Reseller we really recommend Mackeeper! BEFORE POSTING ANY NEGATIVE FEEDBACK PLEASE CONTACT US FIRST! ALL MACKEEPER LICENSES ARE GENUINE AND ISSUED IN YOUR NAME AND THE EMAIL ADDRESS YOU PROVIDE PAYPAL. IF THERE ARE ANY ACTIVATION ISSUES PLEASE CONTACT US FIRST. This Software download has over $500.00 worth of software disk utilities Disk Usage Visualize the size of your folders. Disk Usage is the easiest way to detect large files on your hard drive. It scans your folders and marks them with different colors depending on size. Duplicates Finder Remove duplicate files. Duplicates Finder detects file copies that take up space on your Mac's hard drive. Fast Cleanup Clean your Mac quickly and safely. Fast Cleanup finds and removes all junk files on your hard drive with these cleaners: - Binaries Cutter - Cache Cleaner - Languages Cutter - Logs Cleaner Wise Uninstaller Uninstall leaving no junk behind. Wise Uninstaller completely removes applications, widgets, preference panes and plugins. Files Finder Quickly find any files. Files Finder scans your Mac's hard drive for all files of the selected file type. THIS PRODUCT IS A SOFTWARE DOWNLOAD AFTER PURCHASE. Software & Activation LICENSE key for 3 Computers will be emailed after purchase No CD-ROM. PRODUCT will be shipped and of course no returns on software downloads. Do you love your Mac?